The weather stations serve an important role in our lives. If you get one, you will always end up learning more about the weather and plan your day ahead. You will no longer go out without knowing the weather conditions of the day. Instead of relying on the overall weather station of a city, you can always opt to choose a personal weather station for accurate results. 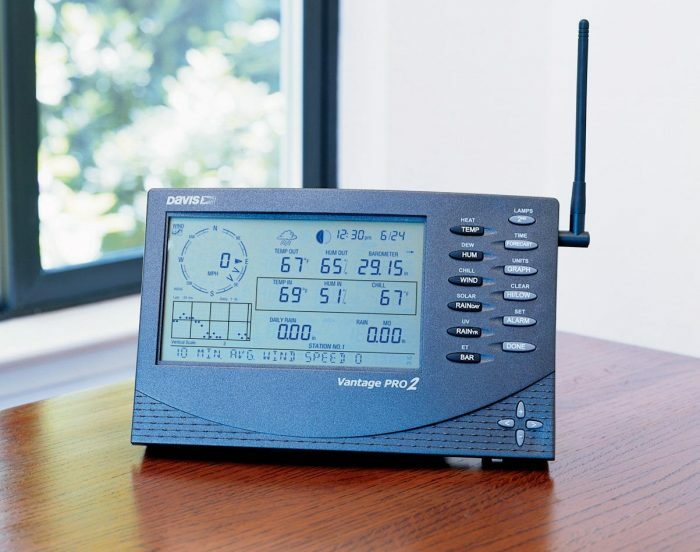 The Davis Instruments Vantage Pro2 Wireless weather station seems to click all the right boxes in terms of features. Many people who have used it before can agree that it can help you learn more about the weather conditions in an area. We get to look at some of the great features it has to offer below. The model comes with the Integrated Sensor Suite that helps in measuring the different weather conditions. The suite has many sensors that make it a suitable personal weather station. This means that you get to learn more about the weather conditions with the model. Wind speed and direction – you can now easily know the direction of the wind in your area and at what speed it is flowing. The wind speed for the model ranges from 2 to 150 mph. You can change the display to show in knots, kph, or m/s. Rain collector – measuring the rain could be great on so many levels such as knowing when to prepare the garden or plant the vegetables. The rainfall is measured in mm or inches depending on how you like it. Temperature – the temperature sensors can be great to help you decide what to wear for the day. The model can show temperatures from -40 0C to 65 0C. Relative humidity sensors – you will also get to know about the humidity levels around your area with such sensors. The range for relative humidity is from 0% to 100 %. The manufacturer understands that the weather station sensors might be exposed to extreme conditions. It is the reason you get a radiation shield with the model. The work of the shield is to protect the sensors, especially the temperature sensors so that the readings are always correct. 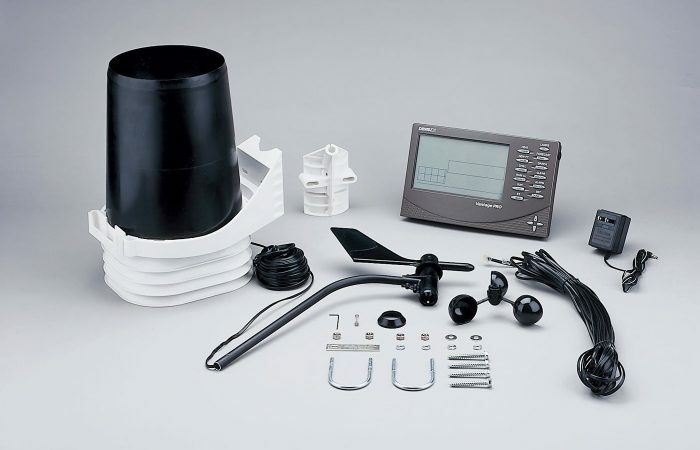 The type of transmission for any type of weather station is crucial. As you already know, this model comes with the wireless transmission feature. This type of transmission is great as you can always receive updates about a weather condition from anywhere within the weather station range. The wireless transmission from the station to the console is up to 1000 ft. or 300m. It is quite enough for any person with the console within the range to get the updates. The obstructions can greatly affect the transmission, so limit the number of obstructions between the console and station for accurate readings. It is also possible to have wireless repeaters that can boost the signal if you are far from the weather station. The console matters a lot as you will be interacting with it all the time learning more about the weather conditions. For this reason and many others, the display has to be great in terms of looks and usability. The console comes with a large LCD screen for displaying all the important weather conditions. Since it measures 6 inches by 3.5 inches, it should be among the big console screens available today. The keypad found on the console is still easy to use for anyone looking to make a few adjustments or settings to the weather condition display. The console will display features such as sunset, sunrise, moon phases, date, time and the weather variables. 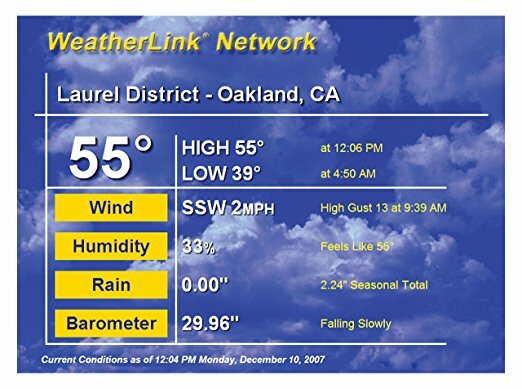 The weather conditions displayed include humidity, barometric pressure, rainfall, temperature, wind speed, and humidity. Thanks to its advanced features, you also get to view other conditions such as leaf wetness, UV radiation, soil moisture and many others. With the graphs available, you can always know more about the different weather conditions in detail. You can visualize if the weather condition is getting worse or still where you want it. There are still the alarm options where you can learn about a weather condition so long as is at a preset level. The alarms will alert you about the conditions so that you can make decisions. There is no doubt that any person with intentions of using the weather station data would want to learn more about how the data changes. It is the reason you would need an additional software to do all this. It is possible for you to connect the model to a PC, Mac or IP by using the Davis WeatherLink Data Logger and Software. The data logger and software will now collect the time stamped data from your weather station console at different intervals. The intervals can vary from 1 minute to 2 hours. You can compare between the Mac or Windows version to see which one works great for you. It is easily noticeable that the Mac version does not have the functionality of logging the data on leaf wetness, UV radiation, and soil moisture. If you have to get yourself a software to use for this weather station, check out the following link. The weather station comes with multiple components that would need to be powered in order to deliver the accurate readings. For this model, it has a console and station that are powered differently. The console is powered by 3 C cells batteries that ensure it is running all the time. You also get a UK 230V power adapter included in the model. The work of the adapter is to make sure that you end up powering the console if you want to save on your batteries and use them only when necessary. The station with sensors will also need power. Since it is outdoors, the idea of powering it with a solar panel seems to be great. Your model will keep on transmitting data anytime so long as there is light. The manufacturer included a CR123 lithium back battery in the station so that it can be active even when the solar power is not an option. This battery can last up to 3 years with regular use. 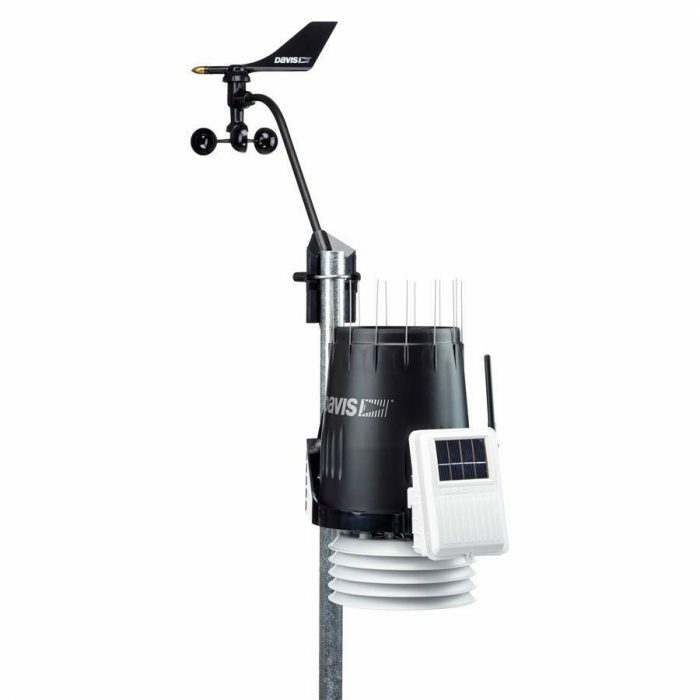 The installation and assembling of the weather station can be a major hurdle for some people, but that is not the case when you get to choose this model. With a few basic tools, the installation process can be carried out. You will not need to waste a lot of time when it comes to setting up the station and console. 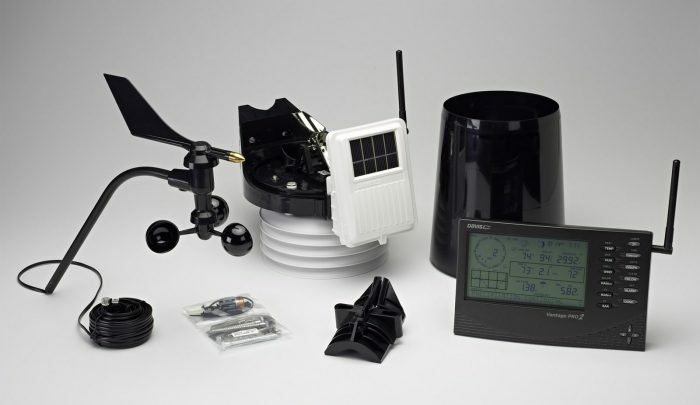 The manufacturer sends you the weather station with additional hardware you can use for installing the different weather sensors. There is a built-in bubble level important for making sure that you install the sensors correctly and on the right level. Do not worry about the construction as the manufacturer made the model to have a rugged housing that can handle the outdoor conditions. You simply have to follow the instructions as given by the manufacturer to get your station and console working properly. The following video can give you additional tips on how to setup the weather station. The manufacturer offers a 1-year limited warranty policy on the weather station. The warranty policy will cover on the defects of workmanship and materials used to make the weather station. The warranty period starts from the date of purchase to a year later. In case you have a defective part on the weather station, you can return it to the company for the repairs or replacement. You should include the proof of purchase and an additional written explanation of the trouble you are facing. The manufacturer will decide whether to change or simply repair the faulty part. Always make sure that you register the product with the manufacturer so that it is easier to make the repairs or replacements whenever necessary. You can more about the warranty information here. The Vantage Pro2 models were created as either wireless or cabled. This review was more about the wireless model, but it does not hurt to learn more about the cabled version too. The two have some similarities and also some differences. Among the similarities, you get to measure the same type of weather conditions whether it is cabled or wireless. Cabled version would need to use a 1000ft cable for data transfer from its station to the console. As much as it might seem a lot of work laying the cable, you only need 1000ft of cable. There is no solar panel for powering the station transmitter, as it will simply send the data using the cable. The next time you have to buy a weather station, you know about this model. The Davis Vantage Pro2 Wireless weather station should give you the perfect experience each time you have to deal with different weather conditions. It has been designed to deliver more than just looking great. The multiple reviews that show the model is great are all true once you get to use it yourself. Go ahead and buy yourself the model to experience more features.